Click to download a PDF of these instructions. View the photos from this gallery in a slideshow or individually. What is the main trick with this bandage? 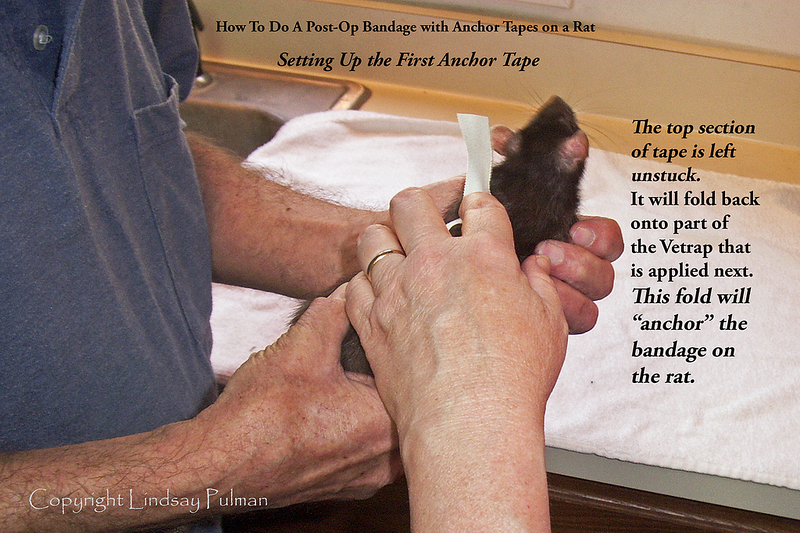 Step One: Set up and apply two "anchor tapes"
One method to bandage a pet rat uses anchor tapes, which will hold the bandage on the rat, as opposed to securing the bandage using excessive bandage material and/or tightness. 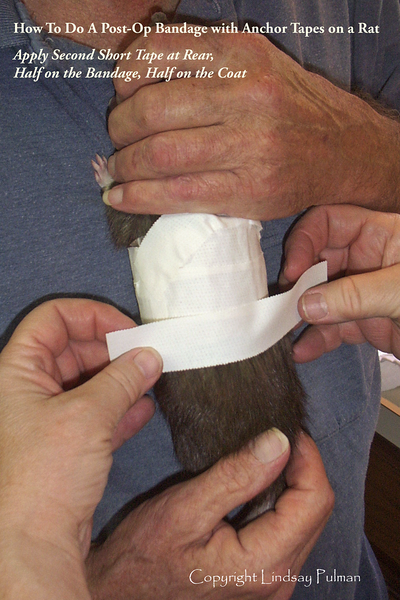 Over-tight bandages may affect circulation or respirations, and a rat who cannot move freely may fight the bandage or stop eating or drinking. 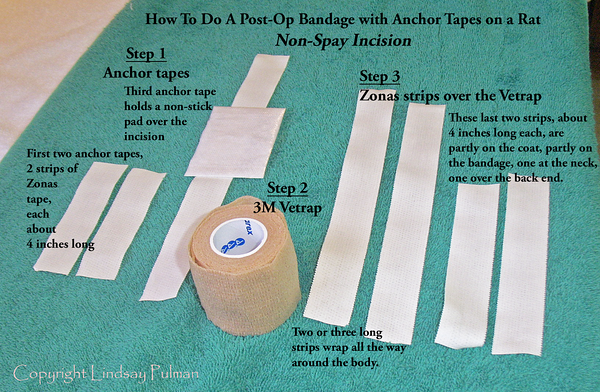 Anchor tapes are very useful for solving many bandaging problems. The wounds or incision sites that lend themselves best to being wrapped are on the torso, neck, or chest. Alternately, if the incision is lower down, like a spay, or an inguinal (groin area) tumor removal site, you can use a torso wrap that does not cover the incision, but keeps the rat from bending around to get at that lower incision. 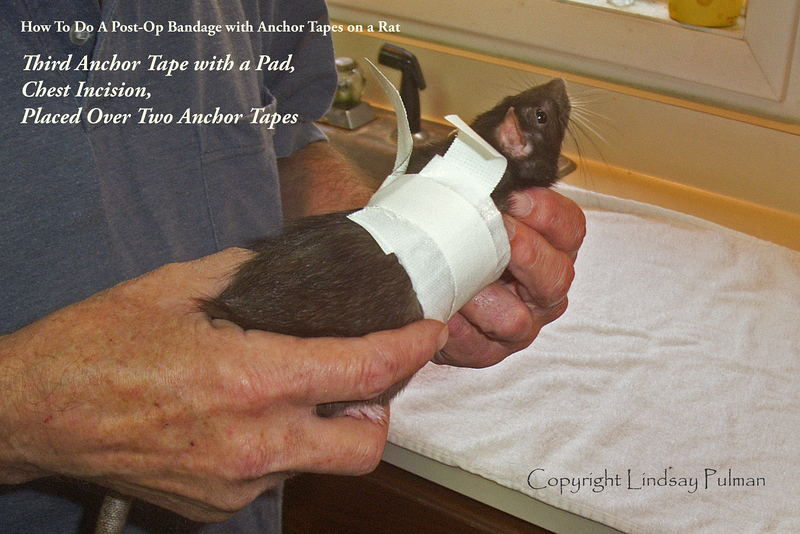 A tail can be bandaged successfully too, with an anchor tape, and a padded wrap around the circumference. Hind feet can be bandaged carefully and some rats will leave the "boot" on, some will not. Face, ear, or front paw would be difficult or impossible to bandage with any method. If applied correctly, and the rat is not too greasy in the area of the back, then it will probably stay on for the duration of healing. And, it should be comfortable for the rat. When the rat decides to get up and move, she may look like a polar bear, or a hermit crab with a shell on, with a very funny tippy-toe type of walk, but she will adapt to it. Many rats may sulk and complain and refuse to eat or drink. Or pout, struggle, whine, refuse to walk, and roll over. If this happens, wait her out while supporting her with some hand-feeding, including using a syringe. 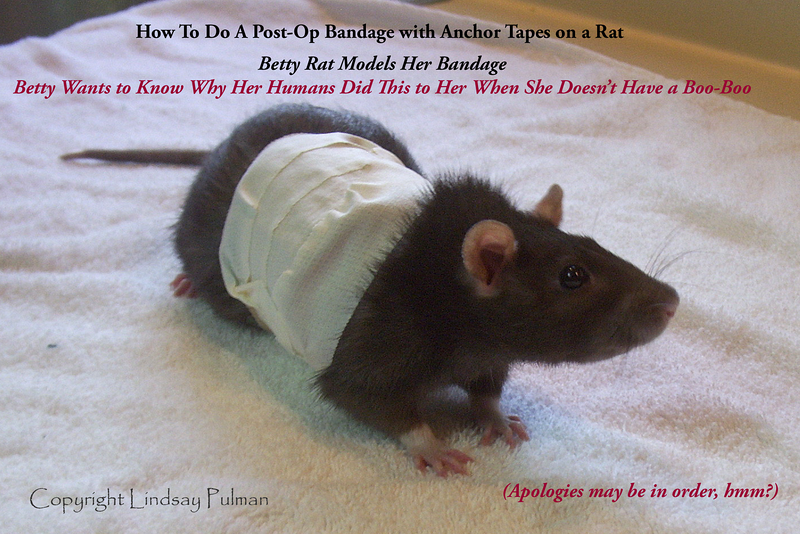 Within about 48 hours, almost all rats will give up, accept the bandage, and learn to function with it. The rat can eat and drink normally with a torso bandage, but make sure the water bottle is within easy reach, and the sides of the food dish are not too high. If applied properly, with free movement of front and hind legs, she will even be able to climb ladders. 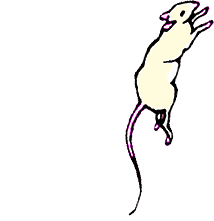 With spays or other abdomimal cavity surgeries, though, it is prudent to remove ladders and other items, such as boxes that the rat might climb, for the first 4 or 5 days of healing. Confirm with your vet the ideal number of days to restrict your rat's activities. Zonas tape, 1-inch width, Johnson & Johnson, reorder number 5104, any drug store can get it for you. Zonas tape holds well, but is a little less sticky than other adhesive tapes, and makes removal easier. Small surgical style scissors that have one blunt tip, or small standard bandage scissors) small width. Non-stick pads (or Telfa Pads) that can be cut to size. Help your rat in advance, by teaching her to accept syringe-feeding. Practice with a variety of yummy fluids so the rat becomes accustomed to eating from a syringe. This will be helpful if, after the bandage is in place, the rat decides to protest it by not eating. 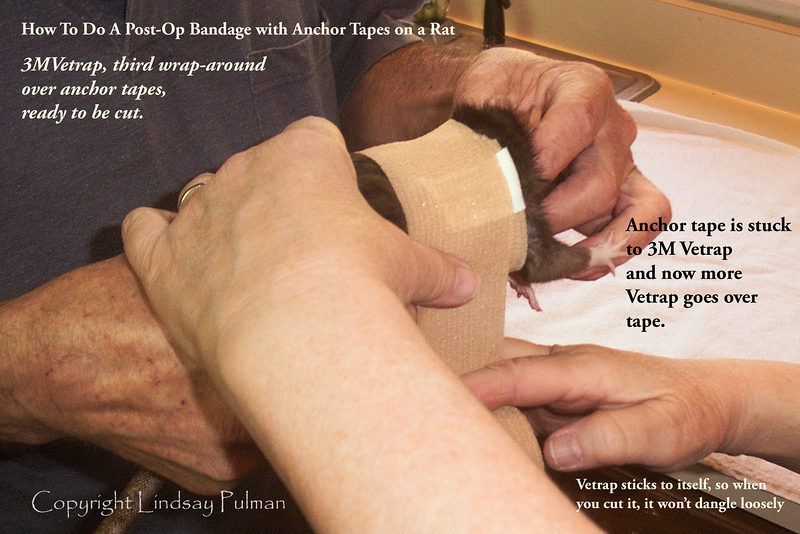 The whole trick is to use "anchor tapes" to "anchor" the bandage to the body (the coat, not the skin). 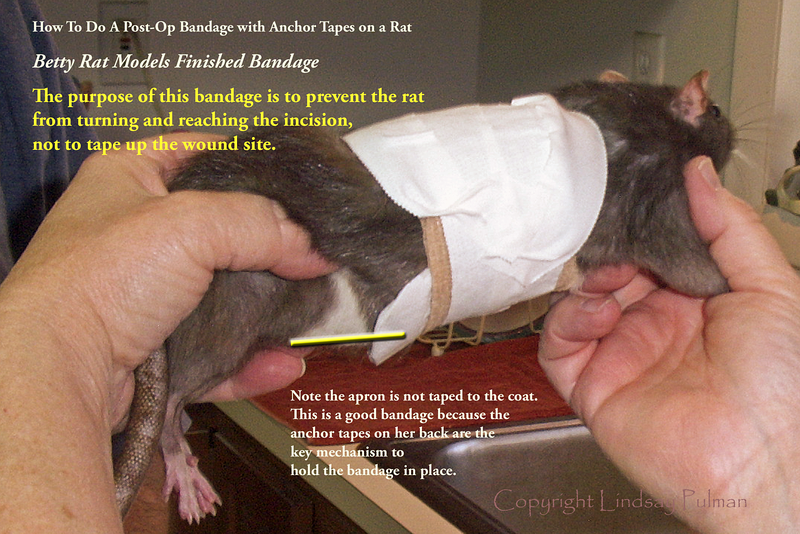 In this way the bandage does not have to be tight or constricting, and the rat can't slide it off. 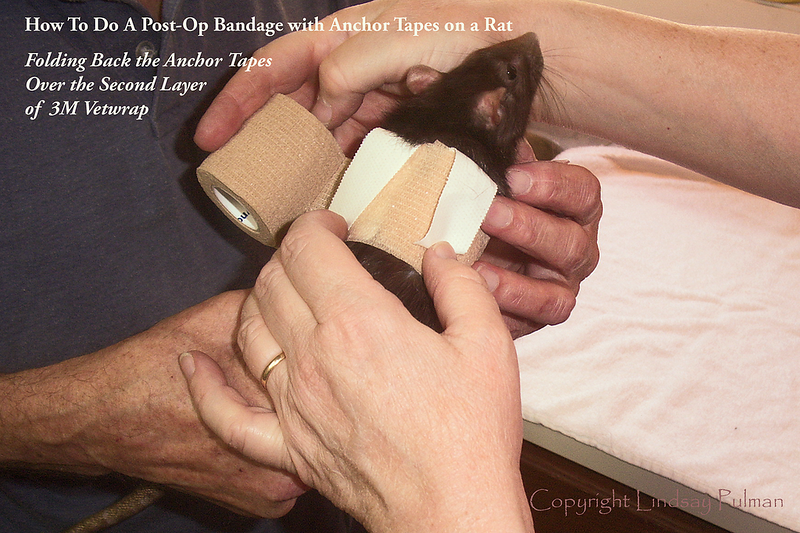 Anchor tapes are applied directly to the coat before the bandage is even applied. There are 2 anchor tapes applied lengthwise along the back. 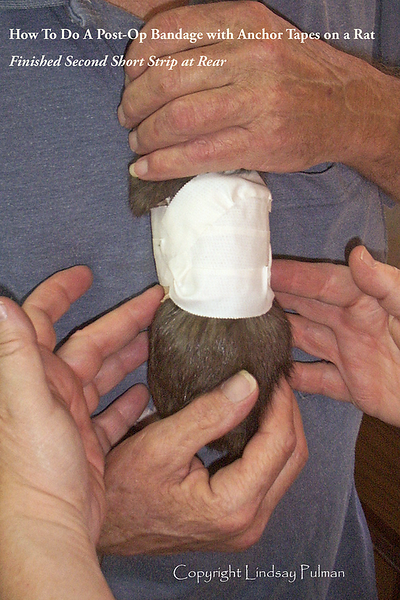 A third tape holds the non-stick pad over a chest incision, or holds a non-stick "apron" over a spay area; it is added around the mid-chest area circumferentially. 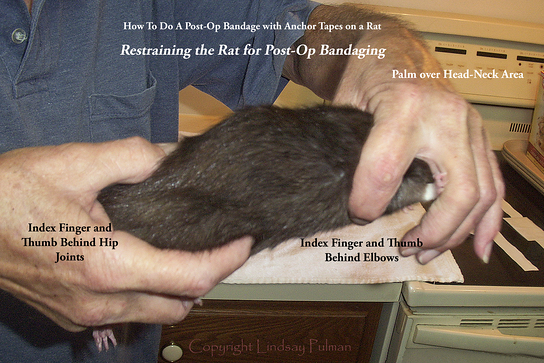 In the end, the bandage should not be so far down that the rat can reach it with the hind legs. 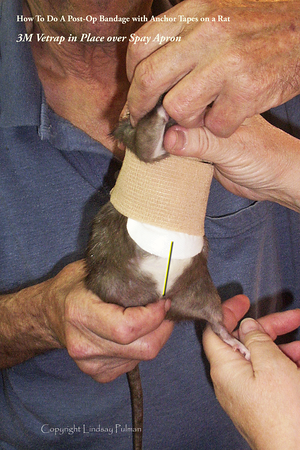 The rat needs to be mobile and unable to reach the bandage with her hind legs or teeth, and the bandage should be located where it can't be soiled via her private parts. 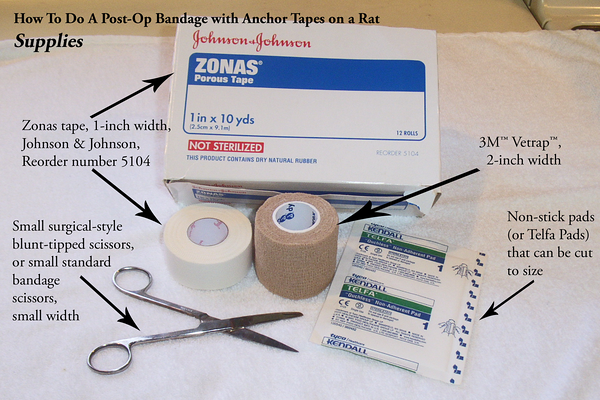 Step One: Set up and apply two "anchor tapes", using strips of Johnson & Johnson, 1-inch Zonas Athletic Tape (adhesive tape, reorder number 5104). The two anchors are 2 strips of Zonas tape, each about 4 inches long. Apply each one length-wise, on the rat's back, about a half inch apart on either side of the spine, with the first half inch - from the shoulder blade forward towards the neck - left unstuck. 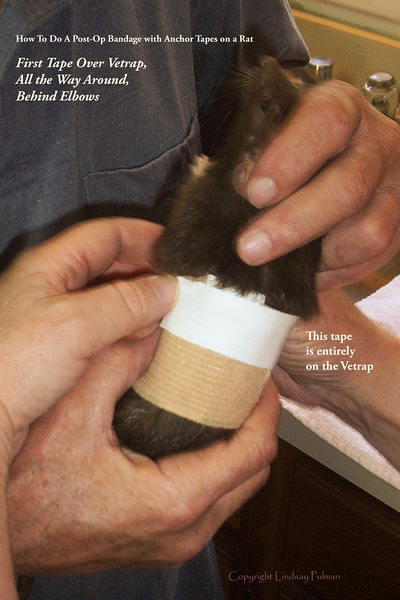 With good restraint, you can insure these tape ends stay loose until Vetrap is applied in Step Two. Prepare the tape that holds the non-stick pad (to cover the tumor incision, or as an "apron" for a spay), which should be just long enough to go around the middle chest area. See examples in Supplies section above.) The pad for an incision on the chest should cover the whole incision, and the tape should wrap around, over the original 2 anchor tapes. For a spay incision, think of your Grandma's half aprons - corners trimmed off to curve the edges. The apron hangs down partially over the incision, keeping the bottom edge of the Vetrap (applied later) from sticking to or irritating it. The apron does not have to extend over the whole incision. The tape holding it should wrap around the mid chest, not over or near the spay incision. We do not want to put pressure on that incision. Apply the tape with the pad covering the torso incision, laying the tape part over the original two anchor tapes. 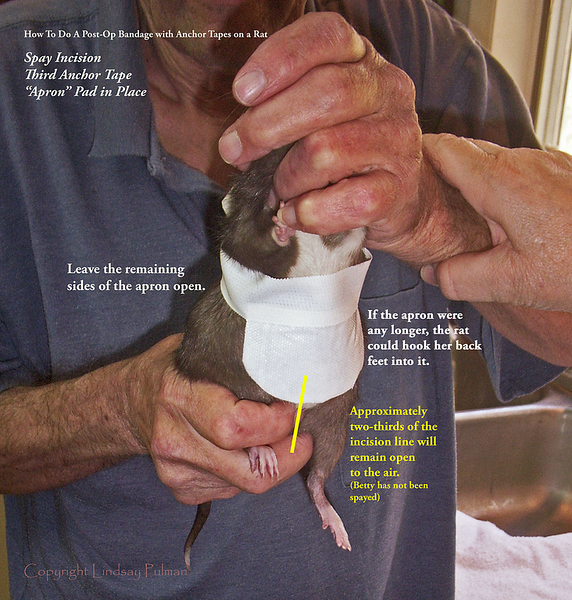 If this is a spay bandage, position the tape so that the apron covers about the upper half of the spay incision - no more than that, as the rat would then step on the apron with her back feet. Apply the tape gently, no constriction, just conform it to the surface of the rat. Make sure it is stuck to the two first anchor tapes. These 3 pieces of tape constitute the "anchors". 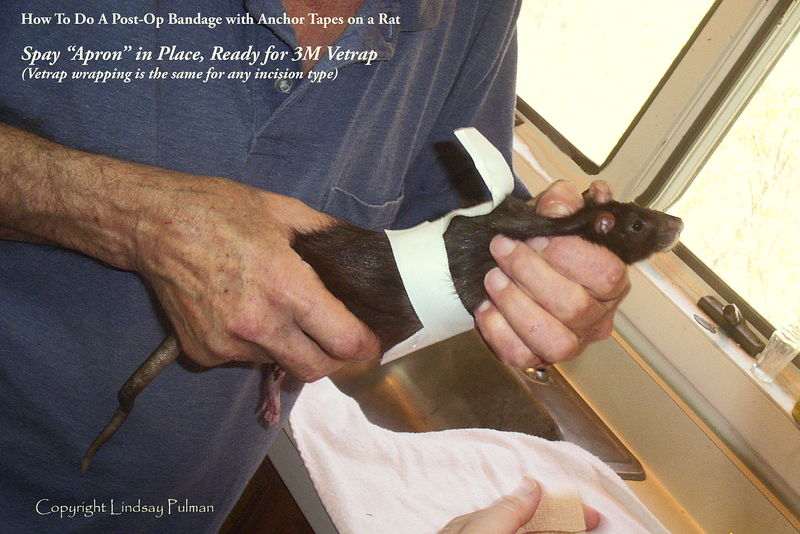 Step Two: Wrap the rat with 3M™ Vetrap™. 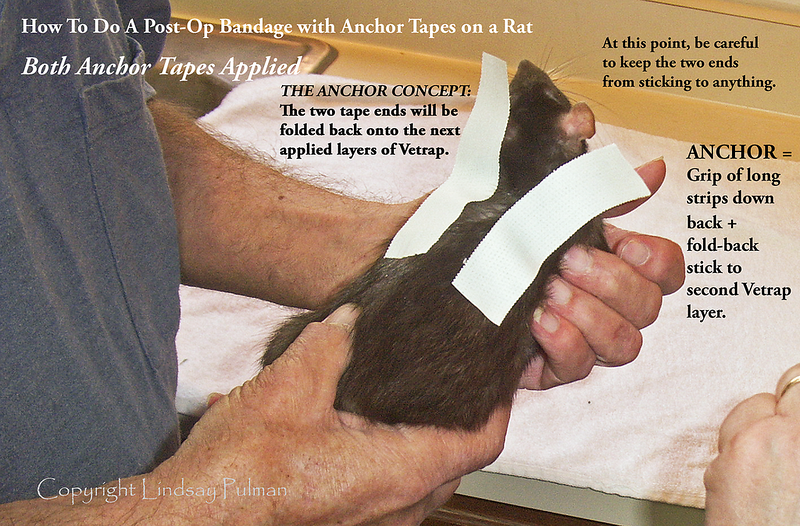 The human version of Vetrap™ is a lightweight, stretchy elastic wrap which will stick to itself but not the rat. Unroll the Vetrap at length, to loosen the "elasticity", and then loosely roll it back into a roll. This will help avoid having to pull it to get it unstuck. Never stretch Vetrap tightly around the rat. Only conform to the surface contour of the rat. Start the wrap right behind the elbows (over the shoulders, around the thorax), and wrap once around. Now comes the all-important anchor tape mechanism: Fold the two leftover one inch pieces of tape (that were higher on the neck) back onto the Vetrap before you continue wrapping, and apply the second layer around the chest. This effectively anchors the bandage to the rat. Be careful not to pull the Vetrap or the anchor tapes tight. 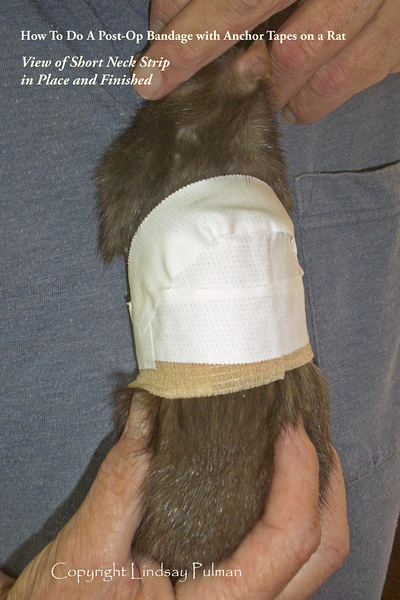 All bandage material only contours to the rat's body. Now apply the third and last layer of Vetrap, moving slightly farther down the torso. End it at the last ribs, at least one inch forward of the place where hind legs join the torso. If this is a spay bandage, keep the Vetrap loose enough, especially when you come near the spay incision, that you can get an index finger between the belly and the bandage. Be careful not to apply pressure near the incision. Do not place Vetrap over the spay apron. 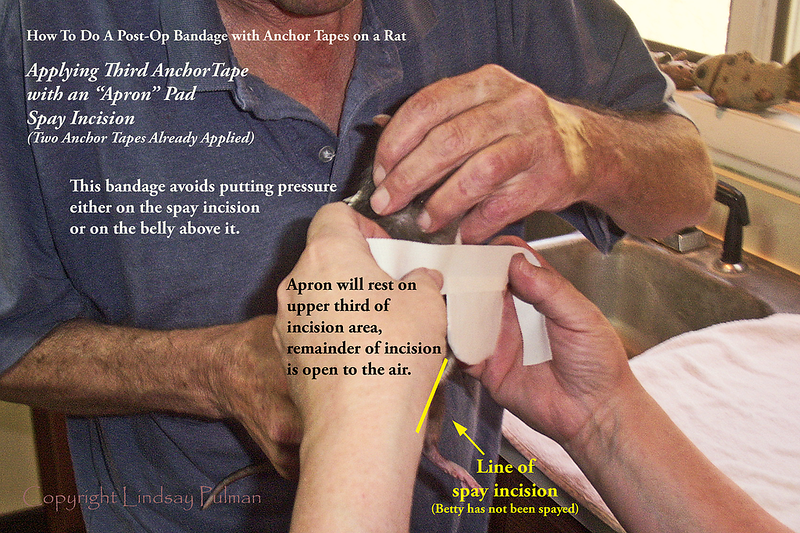 The apron should be the only part of the bandage that lays over the top portion of the spay incision. Step Three: Apply Zonas tape strips over the Vetrap. Cut however many strips of tape it takes to cover the Vetrap with one layer of tape. Cut in lengths that will go once around the body. This will stiffen the bandage a little. Apply loosely to just conform to the surface of the Vetrap. 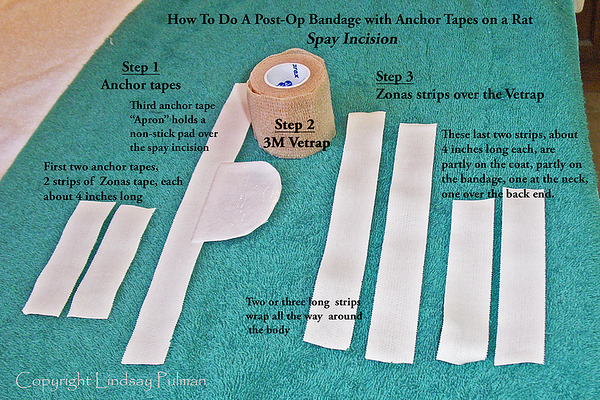 Cut two 4-inch strips of tape to finish anchoring the bandage to the body. 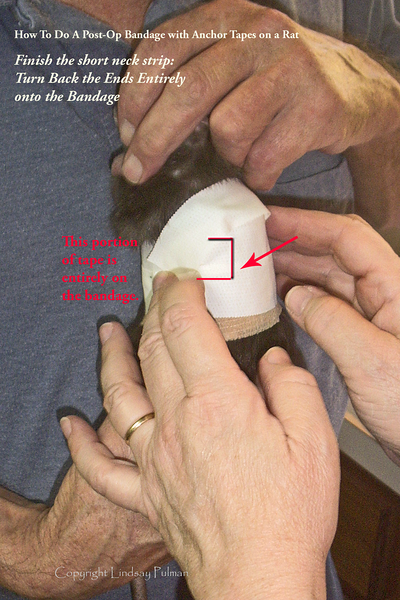 Place one strip at the neck edge of the bandage, half on the fur at the base of the neck, half on the bandage. End by bending/ turning each tape end back fully onto the bandage, over the ribs. 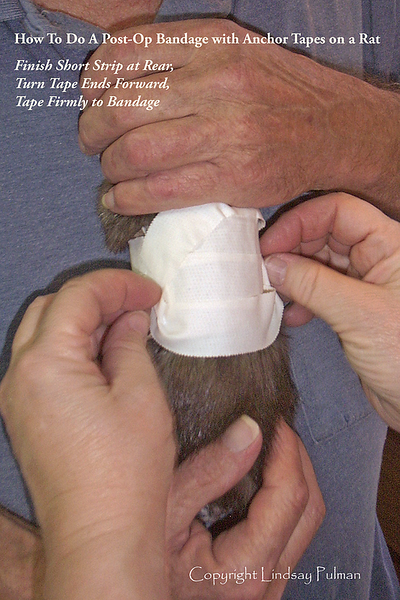 Apply the second 4-inch strip at the other end of the bandage edge, over the back, half on the fur, half on the bandage. Turn each tape end forward so it sticks to the bandage. These two 4-inch pieces do not wrap around the body, just over the top half. They may loosen but are easily removed and replaced during the bandage time period. Step Four: Assess the bandage. 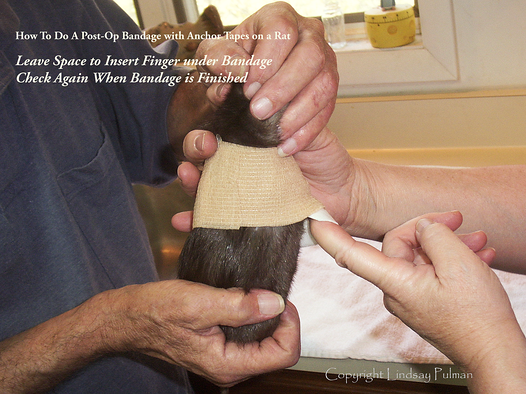 The back edge of the bandage should be far enough forward from the hind legs that (1) the rat cannot reach the edge with her hind feet, (2) the rat can move her hind legs and knees forward and backward, well enough to walk, and (3) the bandage will not get soiled from poops or pees. If it’s a spay bandage, look at the apron. Is it trimmed sufficiently so that the hind feet can function without stepping on it? Test it out. Put the rat on a carpeted floor and let her walk. If not, trim accordingly. The apron is just to protect the incision from the lower edge of the Vetrap, and to partially protect the incision from bedding, etc. It is not meant to entirely cover the incision. Air circulation is important. Look at the elbows. Is the bandage allowing movement of elbows so that the rat can walk? If not, take the scissors and carefully trim a little bandage back, in a half moon shape, behind the elbows, to make her comfortable with elbow movement. Insert a finger between the belly and lower Vetrap edge, it should have a finger's width space so there is no belly constriction. A few rats will spend every waking hour chewing at the forward edges, especially under the chest, and you will have to repair with zonas daily. Remove any running wheel, or small diameter cardboard tunnels, from the cage, because a few rats may (deliberately?) hook the bandage underneath the wheel or on box edges, and tear it or free themselves. 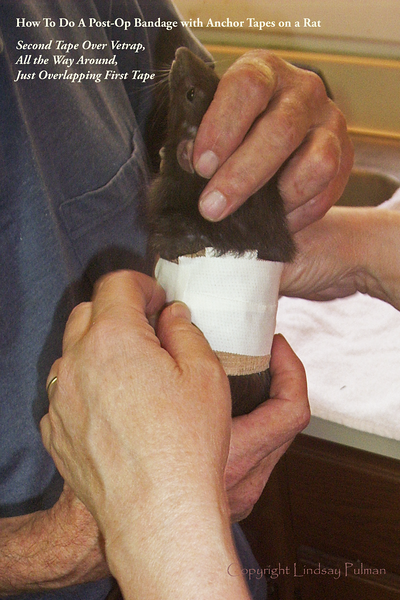 A very few rats may successfully hook their feet on the back edge of the bandage, and slide themselves free. Some may be simply impossible to keep bandaged. Those will have to be watched. Read the story of one such rat, Anastasia, for an in-depth look at When a Rat Won't Leave a Bandage or Wound Alone. If the calm but determined rat gets the bandage off, you should put another on. Maybe your technique needs to be refined. 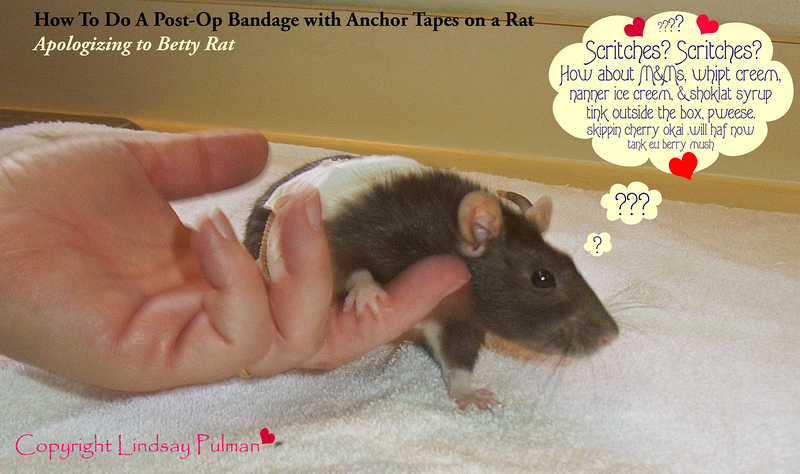 Boy rats will usually give up and let the bandage alone. Girls can be so fastidious that they can't stand having any foreign object stuck to them. Girls may work harder at getting the bandage off. Occasionally (maybe one in a hundred), a rat will panic when you release her for the first time. He or she may scream, kick, flip, and just absolutely freak out. Hold the rat for awhile, and see if s/he will calm down and adapt. If not, the bandage will have to come off. This special problem rat will have to be watched as much as possible, and the incision repaired as soon as you see any removal of staples or suture material. It is critical to address any skin closure removals done by a rat on a spay incision, as some rats will remove both skin and abdominal wall sutures. This unfortunately can end up as a critical, life or death emergency repair. Removing the bandage. Removal is a little tricky and should be done carefully. 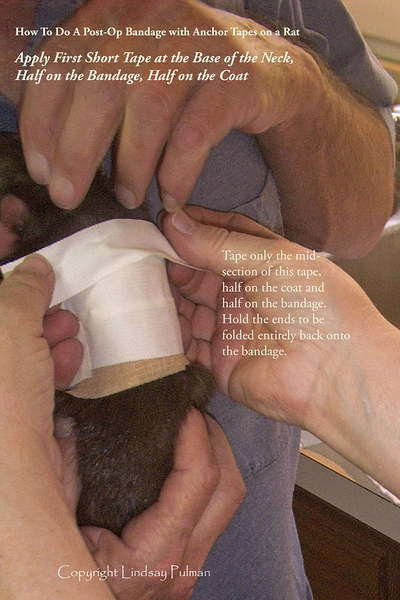 Remove the "over the neck" and "over the back" 4-inch strips first, gently burrowing a finger between tape and coat to encourage release of the tape. Then, use a scissors with one blunt end (blunt/sharp or blunt/blunt surgical scissors) or, a small bandage scissors, and gently start working the blunt end of the scissors under the bandage. Guard the body with a finger, if possible, from either the front or the back. Work on an area away from the incision area, and between or beside the two anchor tapes originally put on the back. Once you have cut through the bandage longitudinally, then start to remove the taped areas by "scraping" the hair gently off the taped areas. (Hold the taped portion of the bandgage with the other hand.) Use a motion that resembles grooming. Avoid pulling the tape off the body as this pulls out more hair and is more painful. Work slowly and have patience. Most rats will tolerate the removal but most will squeak protests during the process. It is common for rats to clean themselves agressively for long periods after the bandage comes off. There is inevitably some adhesive left on the hair, and most rats are obsessive about getting it off. If you have any trouble removing the bandage off, please let your veterinarian remove it. WARNING: Do not use scissors with two pointed ends. You risk cutting skin if you insert a pointed end under the bandage. If you don't have the correct type of scissors you will be forced to unwrap the whole thing in the same order you wrapped it on, which can be difficult, but can be done. 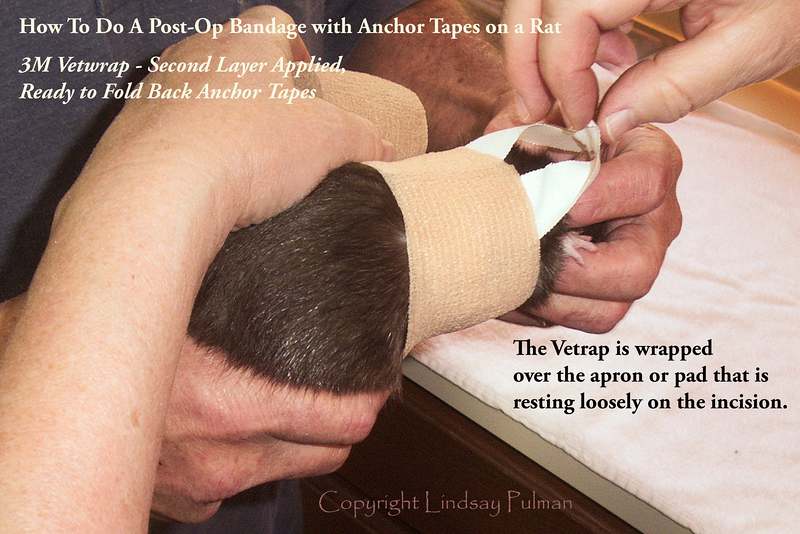 The Vetrap layer can come off first if you cut through the two forward ends of anchor tape that you folded back. After that, work on releasing hair from the two original anchor tapes and the circumferential tape that holds the apron. For the anchor tapes, use a finger, and in a grooming type of motion, start to release anchor tape strips from hair. This can be uncomfortable for the rat, and she may squeak and whine and struggle. Go gradually, and just get the tape loose. With skill, unwrapping the bandage can take about 5 minutes of work. This can be hard for new rat persons who don't know how to restrain rats appropriately (gently but well), and/or hard if you have a rat who bites. During bandage removal, gentle restraint is very necessary, so have your human assistant handy. JoinRats, Lindsay Pulman and associates assume no responsibility for the misuse or misunderstanding of the information here, and make no guarantees with respect to results that may be obtained from the uses, procedures, or recommendations listed within this article. The information in this gallery is strictly for educational and informational purposes only, and does not replace qualified care by a Veterinarian. This is not a "burrito" bandage, it's better. This loose-fitting yet secure bandage uses an anchor-tape mechanism. Please print the PDF instructions in this gallery and give them to your vet. This technique is not widely known yet may save the lives of many rats who irritate incision sites or bandages. Lindsay Pulman's technique is invaluable. 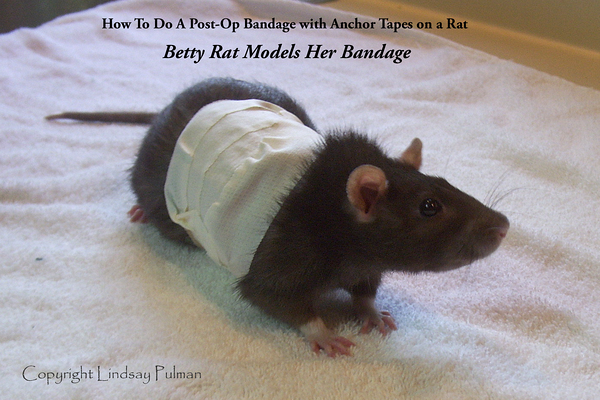 Visit "How To Do A Post-Op Bandage with Anchor Tapes on a Rat"
for the instructions and PDF.